The Hudson Area Library is proud to present a sneak preview of the World Premiere of Mortality Mansions on Friday, March 24 at 6pm in the library’s Community Room. 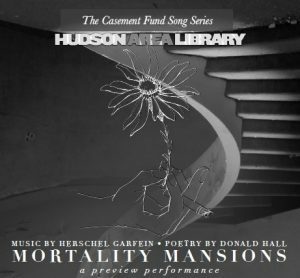 Mortality Mansions is a song cycle by Grammy Award-winning composer Herschel Garfein and distinguished American poet Donald Hall, former Poet Laureate of the United States (2006 – 2007). The song cycle explores themes of love, sexuality, and bereavement in old age. This project was created in collaboration with The Heyman Center for the Humanities at Columbia University, the Program in Narrative Medicine at Columbia Medical Center, and Sparks & Wiry Cries, for their Casement Fund Song Series, with special thanks to Barnard College and Columbia University School of the Arts. We are honored to offer this sneak preview at the Hudson Area Library. It will be premiered at Barnard at the end of March. The featured performers are tenor Michael Slattery (“elemental emotional force” –Financial Times; “sweet-toned tenderness” –New York Times), and Dimitri Dover, acclaimed pianist for the Metropolitan Opera Lindemann Young Artist program. Composer Herschel Garfein will join the artists, reading and reflecting on the poetry of Donald Hall that he has set to music in this song cycle. This event is free and open to the public. It will take place in the community room, which is wheelchair accessible. This entry was posted in Adults, Programs, Young Adults and tagged medicine, music, narrative medicine by Brenda Shufelt. Bookmark the permalink.